Career Companies are an award for employers who offer unique career and development opportunities for both you as a students and for those who have already worked for a few years. 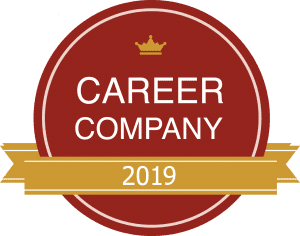 Here you can read about all Career Companies 2019. The goal of the Career Companies is to guide you as a student or who has recently started working, for a good start on your career. Since 2011, we have examined the country’s leading companies and organizations to find the employers who can offer the best career and development opportunities for young talent. Our list of Sweden’s top 100 employers comes out once a year and the employers on the list have the right to use our award, the emblem ”Career Company”. So the next time you see the emblem ”Career Company” you know that you have an employer that is worth to go for!